For some, the idea of setting off with nothing but a backpack for company is utterly terrifying. For others, it is the best and only way to travel. We take a look at some of the pros and cons of travelling solo. The major bonus of travelling on your own is having the freedom to do whatever you want, whenever you want to do it. With nobody else around, you can plan your itinerary to suit your own particular travelling style. Travelling alone allows you to adapt and change your plans at short notice without debate or compromise. Solo travellers tend to be more approachable than groups. You’ll be able to mingle with other backpackers, and make lots of new friends en route. No matter how much you like your friends, spending 24 hours a day with one person can become tiresome. If you do plan on travelling with someone, it’s perhaps best to test the waters first with a short trip, so you can familiarise yourself with their habits and moodswings. Groups of travellers will always attract more attention than a lone traveller, particularly from locals touting for business. When travelling alone, you’ll have more time to really reflect and learn about yourself. No matter how independent you are, solo travellers will always suffer the occasional bout of loneliness. You can however combat this by heading to traveller spots to meet other single explorers. Travelling in a pair or a group can feel much safer than being alone. You can look out for each other and watch over each other’s belongings. If you are travelling solo, there are some precautions you can take, for example, don’t arrive at your destination during the night. Travelling alone tends to be more expensive. Hostels typically charge by the room, not by the number of people staying in them. People travelling in groups can split the cost of food and other expenses. If you’re travelling alone, you’ll probably end up with lots of ‘MySpace’ style pictures, because you’ll have no one to snap your pic at all the wonderful places you visit. If you travel alone, you’ll be completely responsible for your own actions. There will be nobody there to look after you, or to tell you when you’re too drunk, or when you’ve spent too much money. Mafia Beach Bungalows are low cost bungalows situated in Utende on the Chole bay of the island. The Mafia Beach Bungalows are built on a one hectare piece of land situated in the marine park. the Eco-friendly lodge is engulfed in the tall coconut and palm trees with a fantastic view of the Indian ocean and the mangrove forests which gives you the tranquility you need to rewind the days events. We are the only low cost lodge with beach front,nice beach and child friendly waters. Our on site bar and restaurant will keep you satisfied with cold cocktails and an array of fresh seafood dishes with a Swahili twist. Our Dive and activities center will take care of all your land and sea excursions. We are located 15 km from the airport and Kilindoni harbour. Bridging the ecosystems of the Congo and the Great Rift Valley of the east you will find a home to the biological riches of both worlds. 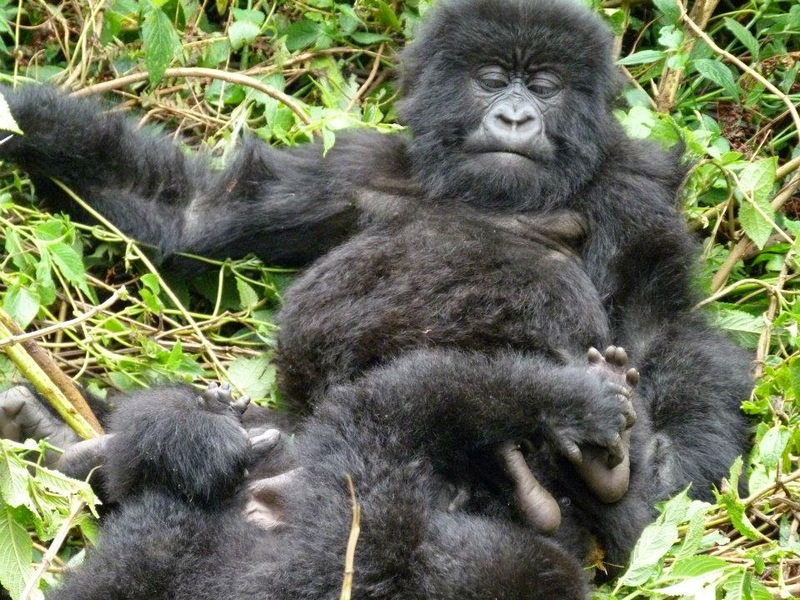 Reaching the depths of the cradle of the mountain gorillas and staring into the eyes of these gentle giants you will discover a different form of a *man*. Some actions geared towards a partnership with the domestic and international tour operators, lodges and hotels has been a driving force for promoting cultural tourism and aspects such as infrastructural development has made its mark when it comes to improving the county’s tourism industry. The visibility tiny country is moving forward in terms of tourism and even more plans to improve and strengthen the sector for it to succeed are in the pipeline. Malindi Kenya’s ‘Little Italy’ is a small town located in coastal Kenya. It acquired the name ‘Little Italy’ because of the growing Italian population in the area, which is more than 3,000 at present. It is also estimated that Italians own more than 2,500 properties there. Three decades ago, the scene was not the same. The first batch of Italian tourists flew into the scenic coastal town in 1978 to enjoy the beautiful white sand beaches. The number of flights has been increasing ever since. Smooth cultural integration between the locals and tourists has been a major factor facilitating the transaction. Locals in Malindi have grown fond of the Italians to an extent that their relationship crosses commercial boundaries. You’ll definitely be forgiven for mistaking that you’re in Rome when in Malindi. The billboards are filled with Italian advertisements. Interestingly, locals from all walks of life in the quiet town are eloquent in the language as well. Africa’s archaeological sites helped explain some of the greatest mysteries in history of mankind but there are also many that baffle modern scientists. This is because these early societies weren’t supposed to be as advanced. Here is a list of 10 incredible archaeological sites in Africa. Olduvai Gorge is one of the most important archaeological sites on earth, let alone Africa. This is owing to the fact that it showcases the progress of human evolution. The fossils found here date back to more than 1.9 million years ago and include evidence of man as a scavenger, hunter and social being. Various types of tools have been discovered as well. From the mid to the late 2nd millennium BC, Egyptian pharaohs and some members of nobility were buried in tombs constructed in the Valley of the Kings. The area has been receiving visitors since antiquity which is evident from Greek and Latin inscriptions on the walls. Unfortunately, not all visitors were tourists and over the centuries most of the 63 tombs in the area have been robbed. Gedi was a city along the Kenyan coast that flourished from the 13th to the beginning of the 17th century. In the 1940s, the archaeologists excavating on the site uncovered some very interesting artifacts. These include items originating from far overseas including Spain, Venice, India and China. The city had an impressive palace, a large mosque and exquisite stone houses. In 1976, the renowned British paleo-anthropologist Mary Leakey discovered footprints of a hominid in Laetoli. Footprints in volcanic ash revealed that this early man walked in an upright manner. Other footprints were found as well, including from hyenas, rhinos, birds, baboons and even gazelles. The scientific community was astounded since the Laetoli discovery proved that early man was walking upright approximately 3.6 million years ago. The Sterkfontein Caves are often referred to as the Cradle of Humankind as there is no other place on earth with a larger number of hominid fossils. To date (paleo-anthropologists have been excavating on the site since the mid-1930s), remains of about 500 hominids have been found with ‘Mrs. Ples’ and ‘Little Foot’ being the most prominent. While ‘Mrs. Ples’ is the most complete skull of Australopithecus ever found, ‘Little Foot’ is one of the most complete early hominid skeletons in the world. The Blombos Cave has helped answer many questions about Homo sapiens that occupied the area some 100,000 years ago. The mystery of cultural origin and behavioral patterns of early man is slowly being uncovered here. According to many paleo-anthropologists, modern human behavior can be traced back to this group of Homo sapiens that was shown to be very innovative, well organized and creative. The site was discovered in 1991. Meroe was one of the wealthiest cities of the ancient Kingdom of Kush. Established in 800 BC, the city was influenced greatly by the neighboring Egyptian civilization. But in the 3rd century BC, the Egyptian art, language and writing began to disappear. In the 3rd and 4th century AD, Meroe started to decline, mainly due to the collapse of external trade. Nevertheless, the remains of this ancient city which include over 200 pyramids still stand as evidence of its former splendor. Nok is a village and an archaeological site in Nigeria which is famous worldwide for its terracotta figurines. The site has been dated to the mid-4 millennium BC (disputed by some) and gave name to the so-called Nok culture. This ancient civilization emerged in Nigeria in the 11th century BC and collapsed around 300 AD for unknown reasons. Archaeological finds reveal that the Nok culture was highly advanced even though West African societies supposed to be primitive at that time. The area around Koobi Fora is renowned for sandstones and siltstones containing well preserved remains of hominins and terrestrial mammals dating back as far as 4.2 million years ago. Hominin fossils that have been discovered in Koobi Fora include: Australopithecus anamensis, Australopithecus boisei, Homo habilis, Homo rudolfensis and Homo ergaster. Also found were many stone tools most of which, however, aren’t associated with hominins. Laas Gaal is a complex of rockhouses and caves containing rock art dating back to 9,000 BC. The rock paintings shows people worshiping cows with large horns and ceremonial robes. Locals knew about the rockhouses and caves for hundreds of years before a team of French researches discovered the site in 2002. Like many other archaeological sites in Somalia, Laas Gaal hasn’t been fully explored yet.